The cyclical nature of the domestic sugar sector has over the years resulted in massive arrears at the end of successive sugarcane crushing seasons, especially in Uttar Pradesh, the country’s top sugar producer. Amid the state's gur (jaggery) and khandsari (raw and unrefined sugar) units facing roughshod over regulatory and policy issues, the sugar mills, mainly those operated by big corporate groups, remained the only option for farmers to sell their crops even when the arrears were piling. In times of glut in the domestic sugar market and crashing retail prices, the mills have been quick to express their inability to settle arrears within the stipulated timeframe owing to squeezing margins and cash flow challenges making outstanding delays for months or years together. To break the monopoly of sugar companies in the sugarcane value chain, the UP government has decided to revive the state gur and khandsari industry to boost local entrepreneurship, create job opportunities and spur rural economy. Since the UP cane area has been growing consistently over the years and this year too it is estimated to increase by 100,000 hectares, the government wants to gear up for the next crushing season 2018-19 with a clear roadmap, which would partly take care of excess cane harvest, rising cane recovery, glut and falling sugar margins. At one point of time, there were about 5,000 khandsari units in UP, which have now decreased to about 157. To incentivise them, the state government has cut the radial distance from the nearest sugar mill from 15 km to 8 km for new licenses. Besides, the state has also waived off all levies on the production of gur as well. The main advantage of gur and khandsari units is that they offer spot payment to farmers without much supply and weighing hassles vis-à-vis sugar mills, who are allowed a window of 14 days to settle payments. Besides, the Adityanath government is mulling to adopt the Brazilian model, where sugarcane is used to produce sugar and ethanol proportionally depending upon the prevailing market forces viz total stock, prices, demand, supply etc. This would partly tackle the cycle of uncertainty in the sugar sector. 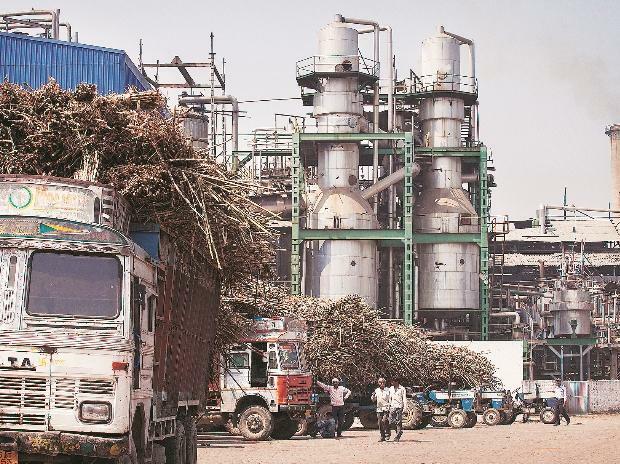 UP sugarcane minister Suresh Rana told Business Standard the state government had studied the Brazilian sugar industry model for adopting the same in the state, so as to give an alternative avenue to farmers to sell their sugarcane during bumper production. The government is already in the process of reviving defunct sugar mills controlled by it, while also upgrading the low capacity units as integrated sugar complexes, incorporating sugar factory, power cogeneration and distillery. The sugar industry is the largest agro-based organised industry in UP and is estimated to generate direct economy worth over Rs 350 billion annually while providing direct and indirect livelihood to about 50 million rural populace. Meanwhile, in the current crushing season, the UP sugar output has already breached the level of 10 million tonnes (MT) with 2-4 weeks still to go before the season concludes. However, the arrears have also piled to about Rs 90 billion.